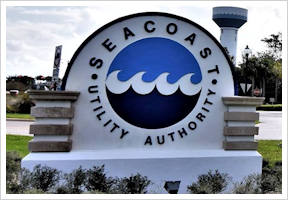 Seacoast Utility Authority (SUA) is a publicly owned water, wastewater, and reclaimed water utility that serves approximately 49,263 households and 2,954 commercial establishments. The Authority's 125 employees cover an expansive service territory (approximately 78 square miles) that includes parts of: the City of Palm Beach Gardens, the Village of North Palm Beach, the Towns of Lake Park and Juno Beach, and unincorporated northern Palm Beach County. SUA has been using the Sensus FlexNet AMI system since September 2007. The Authority hosts its own headend system or Regional Network Interface (RNI), and bills monthly using Harris Advanced Utilities. Utilizing AMI meter data to find leaks is a core service that SUA provides to its customers. Prior to implementing AquaHawk™, staff would run "high consumption" reports in the Sensus system to look for problem accounts. "It was difficult to find critical issues because the reports are very long (up to twenty pages) and they're filled with excess information," commented Kim Azulay, Customer Billing Supervisor. "AquaHawk is much easier for employees to identify problems that require customer notification because the system lists accounts with potential leaks, and categorizes them in priority order," she noted. To ensure that customers are alerted seven days a week, including weekends and holidays, SUA opted to use AquaHawk's "Managed Services." With this option, AquaHawk analysts review abnormal use patterns, and send customer notifications on behalf of the utility. All communications are recorded in the application so SUA staff can track what's happening. Even if customers haven't registered for access to the portal, AquaHawk still monitors their consumption if they have a smart meter installed. Should a customer experience irregular usage, an alert is triggered. Contact information--cell, phone or e-mail address--imported from SUA's billing system can be used to connect with the customer. An employee recently notified a customer of a potential leak, but the homeowner couldn't find any visible signs of water. Over the course of several days, however, she used nearly 100,000 gallons of water. The owner hired a firm to conduct a sonic leak survey and they discovered a broken pipe under one of the concrete floors. In Florida, the water table is close to the ground and the soil is very permeable. It can be difficult sometimes to even see leaking water. During Hurricane Irma, AquaHawk found several problems at homes where residents had evacuated. Downed trees, broken fences, and other flying debris had severed house valves and irrigation lines causing leaks. The affected customers were alerted but not able to access their homes. Many reached out to neighbors, family members, and even SUA for assistance. "Our community was really appreciative of the notifications we delivered," shared Bonnie Evans, Customer Service/Billing Manager. The portal has also expanded self-service options for users. "Customers can see their own usage online and we're linking to our online payment system. We also encourage them to set billing thresholds so they can be forewarned before receiving a surprise bill that's hundreds of dollars or more," Ms. Azulay highlighted. Being able to resolve customer complaints more quickly during support calls is another area AquaHawk has made a positive difference. "Our team can pull up a customer's monthly, daily and hourly usage in graphical format, and get a feel for what's happening," explained Ms. Azulay. "The tools help us better communicate key information about the account's water consumption." "If a customer calls and says, 'there's no way I used this much water,' we review the customer’s account on the AquaHawk system. Staff can usually pinpoint the day and time the high usage occurred. The customer will probably have already received a call or notification from the system. We explain that the alert often indicates a leak, a hose left running, or some other issue that should be investigated. Providing the date and time frame jogs the customer’s memory and he or she will usually know why the water usage increased,” Ms. Evans pointed out. When the majority of SUA meters were read manually, it was common for customers to request an onsite meter inspection if they received a high bill. These visits were expensive and time-consuming for the Authority's three field employees. "AquaHawk and Sensus have been huge time savers for us," relayed Channa Martinez, Senior Meter Reader. "We can review near real-time consumption data, and determine from our office, if the customer actually has a problem. In most cases, the issue's on the customer's side of the meter and doesn't require us to send a truck onsite." AquaHawk is a valuable tool that our employees use on a daily basis to better assist our service community. Ms. Martinez and her team also use AquaHawk to find meters reporting negative use. "Meters usually don't run backwards unless they've been installed incorrectly," emphasized Ms. Martinez. "When we see negative use, it's usually because the AMI endpoint radio is malfunctioning and just needs to be replaced." Building a database of engaged customers is one of SUA's goals. They have sent out bill inserts, and customer service staff include a link to "Register for Water Alerts" on all outbound e-mails. Employees also use a new feature called "QuickSubscribe™" to simplify the registration process. When customers call for support, staff members can gather some contact information and add them to the portal automatically. Past due accounts are a headache for most utilities. SUA sends late letters and delivers door hangers warning of an imminent shutoff, to as many as twenty-four customers a day. They are considering using AquaHawk's Group Messaging module to make automatic phone calls and send text messages in hopes of reducing onsite, shutoff-related visits. SUA is also one of the first utilities to enable AquaHawk's improved mobile application so their customers can access the portal with a smartphone or tablet device. "AquaHawk is a valuable tool that our employees use on a daily basis to better assist our service community," declared Ms. Evans. "It also gives our customers more control by enabling them to see how much water they're using, and to receive warnings when their consumption differs from what they might expect."